Dr. Smith's ECG Blog: Inferior and Posterior STEMI. What else? There is an obvious acute inferior STEMI. The inferior Q-waves suggest that there is an old inferior MI or that this one is subacute, but an old ECG was available and also had similar Q-waves.. There is also ST depression in V2 and V3, also minimal in V4-V6. This is posterior injury, which frequently is simultaneous with inferior injury. There are also large R-waves in V2 and V3, which could represent infarction of the posterior wall. There is one other interesting finding. There is some STE in lead V1. There should be some ST depression in V1 corresponding to the posterior injury. Whenever there is inferior STEMI, one should think about Right Ventricular STEMI (RVMI). RV MI can only occur with RCA occlusion, as the RV marginal branches off the RCA. As 85% of inferior STEMI are due to RCA occlusion [the rest due to occlusion of a "dominant" circumflex (i.e., it supplies the inferior wall)], one must frequently consider RV MI. RCA occlusion usually has reciprocal ST depression in lead I (all inferior STEMI have reciprocal ST depression in aVL!) and STE in lead III > STE in lead II. Right ventricular infarct is associated with right sided failure, hypotension, and higher mortality, and also with particular sensitivity to the hypotensive effects of nitroglycerine because the ischemic RV needs higher filling pressures. Fluids are often necessary to maintain BP. The best leads for diagnosis are leads V3R and V4R, with an ST elevation cutoff of 0.5 mm at the J-point, except for males under age 30, for whom a cutoff of 1 mm is more accurate. As always, ST elevation should be interpreted in the context of the QRS amplitude: if QRS amplitude is particlarly high, then more ST elevation is requirred; if particularly low, then less STE is required. Interestingly, this patient had a BP of 190/120 and required IV and oral metoprolol, as well as nitroglycerine, to control his BP. Initial troponin I was 3.8 ng/mL. The patient went to the cath lab and had a proximal RCA occlusion that was opened. The orange colored area is the Definity contrast in the chambers of the heart. The RV is on the left (circled below). 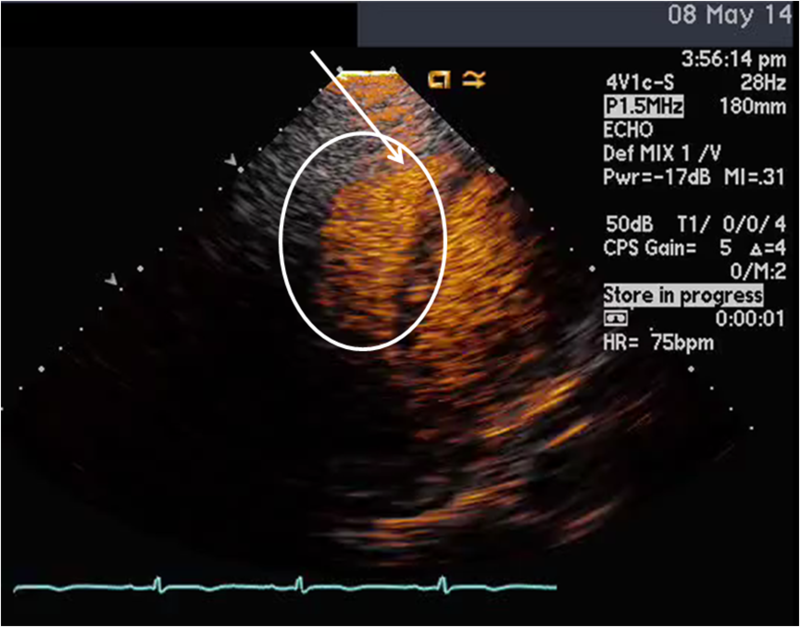 This shows very poor RV function except at the apex (arrow below). This is known as McConnell's sign, and is described for Pulmonary Embolism; here we see it in right ventricular MI. Based on the appearance of the IVC, the RA pressure is low. Normal estimated left ventricular ejection fraction and Normal left ventricular size. Decreased right ventricular systolic performance severe . Regional wall motion abnormality-right ventricle . In inferior STEMI, V1 should be scrutinized for any ST elevation and RVMI should be highly suspected if there is STE, especially if there is posterior injury. It is recommended to record a right sided ECG, as leads V3R and V4R have the best sensitivity and specificity for RV MI. A McConnell’s sign with an RV infarct - interesting! thank you Dr steve , what can we use as pain killer in Rv MI instead of nitroglycerine other than morphia as long as we cant use nitroglycerine ? If hypotension is a concern, you can try fentanyl. Greetings. I've just finished "The 12 Lead ECG in ST Elevation Myocardial Infarction" by Bayes de Luna at al. and this was a nice case to test myself (fortunately, I did well). I'm sure you're aware that it was proposed to discontinue the term "posterior wall", especially when describing "STEMI equivalents" in V1-V2, cause these leads are thought to be anatomically opposed to lateral wall (and also because there isn't much of true posterior wall itself). Can you share your opinion on this briefly? Bayes de Luna just uses different terminology (posterior = inferobasal). But this entity, however you call it, is clearly different from lateral MI (STE in I, aVL, V5, V6). It has ST depression in V1-V4 and ST elevation in V7-V9. It is in every way posterior. This came up in the google search so I wanted to comment, given that this is a great ECG Blog!! The terminology Bayes de Luna uses is inferobasal wall (instead of posterior wall) to refer to that area of myocardium. However, the V7-V9 ischemic changes (Q wave or ST elevations), are equivalent to inverse changes in V1-V2 (tall R-wave, ST depression) --> all of which represent lateral infarcts based on new MRI evidence. Please see Figure 6 in this article. RIP "Posterior MI" - hence we should probably stop using this term. We should decide if it's inferior (inferobasal) or lateral. Chances are it's lateral if you are looking at those leads. There clearly is a posterior wall, no matter what Bayes de Luna wants to call it. I have never agreed with this terminology and in the ECG world we still call it posterior, because it is indeed posterior. "inferobasal" is exactly posterior. The ST depression of the posterior (inferobasal) wall is exactly opposite to the anterior wall. You can measure the ST elevation by putting the leads on the posterior chest. This is a terminology change which appears to give Bayes de Luna several publications but does not make any practical sense. At least to me. Hold on a sec... but the point is that those posterior leads actually represent lateral infarcts - because that's the territory of the Cx artery. What you call "inferobasal" or "posterior" segment is irrelevant.